“Though all of us have been exposed to a number of psychological theories, few have a sense of how to get started in actually working with dreams and with the unconscious. Usually, our energy stays where it started, on the level of theory, and does not translate into a concrete, immediate encounter with the inner self. the meaning of our lives, regardless of how much we know of the psychological theories involved. The point of inner work is to build consciousness. Jung observed that the aboriginal people of Australia spend two-thirds of their waking lives in some form of inner work. They do religious ceremony, discuss and interpret their dreams, make spirit quests, and go walkabout' All this consistent effort is devoted to the inner life, to the realm of dreams, totems, and spirits — that is, to making contact with the unconscious. We modern people can scarcely get a few hours free in an entire week to devote to the inner world. This is why, for all our technology, we may know less of our souls and less of God than seemingly primitive people do. But there is another basic difference between us and aboriginal peoples: They have held onto their ancient forms of worship and of approaching the inner world. When they choose to go to the spirit, there is a prescribed way to do the spirit quest, a prescribed way to understand the dreams and visions, a prescribed ceremony for meeting the gods in the magic circle or at the altar. Robert Johnson got a lot right, even though he also got a few things wrong. It is a brilliant and beautiful passage on dreaming. It is unfortunate that it is written in a way that is not fully sensitive to native people. This book is a product of its time and it is written using some language that is outdated. Unlike what he says, indigenous ways are not primitive nor are they lost to modern people. They are endangered but they are not lost. For those who understand them, they do not appear primitive at all. These old ways are still being practiced and we have a chance to rekindle them. Both traditional and modern dreamwork have a place in the modern world and both pathways continue to help us to bring our attention back to the heart and back to spirit. 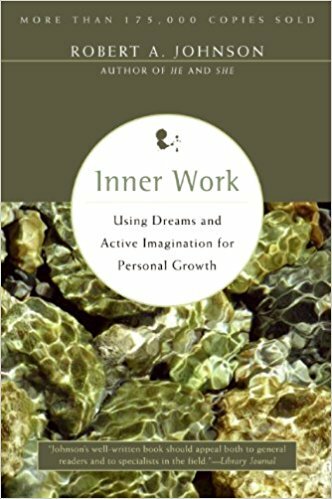 Despite the outdated way of writing, in Inner work, Robert Johnson points out what we have also recognized: There is a deep need for dreamwork in modern times. While we pontificate and analyze, we often miss the concrete and immediate encounters that are also available to us in the land of dreaming. Thankfully, those who are interested in learning how to walk in the land of dreaming still have the opportunity to gather together to teach and to learn the ancestral art of dreamwork. We still have the chance to practice the skill of dreamwork as both a tradition and also an art to be practiced within the modern context. In fact, dreamwork which offers a encounter with the inner self is a kind of special medicine for the ills of the modern mind, heart and spirit. It links us back to our most powerful and innate wisdom, which is the same source of inspiration that has been supporting humanity for all time. Natural Mystery School is offering a dream circle series this fall. We will gather around the fire share dreams and dreamwork techniques. To join us, click here. We will be featuring other books and articles on this website. To get them in your inbox, click here. What does it sound like when trees sing? I haven't seen him since the age of 10 and its likely that he doesn't remember me. But my childhood mentor, Flying Fox told tales about his deep nature connection that were so compelling, they have inspired me for nearly 30 years and counting. Fox said that when he touched the rocks, he could experience geologic time and some trees he befriended would exchange gifts with him. Fox shared a traditional tree honoring song which I remember to this day. He said that if you sang that song and you listened deeply enough, sometimes you could hear the trees singing with you. I wanted an experience like Fox's. With the literal mind of a child, I used to imagine that the song of trees would be the rustle of leaves in the wind and the gifts would be something like a leaf that might fall into my hand synchronistically. I was convinced that if I approached in the right way, I would discover something deeper, something that my heart would know was real. I wanted to connect with nature but I didn't know how. I sat under many trees. I sang the tree honoring song over the years. I got frustrated. I almost gave up. Deep nature connection takes time. It takes sitting in a world of uncertainty and being patient. It is work. But I will never forget the first moment that I heard the trees sing. It was heartbreaking and joyful and not at all what I thought it would be. I was surprised to realize that the song of nature isn't something that happens rarely. It had been happening all around us continuously only I didn't have the ears to hear it until I did. Sometimes I can hear it now, sometimes I can't. It takes a lot of attention to listen so deeply. If you want, you can experience the same thing. It is not a matter of individual worth to be able to listen. Anyone can do it. What does it sound like when trees sing? This is a koan that I am giving to you as it was given to me. Go to the forest. Find a tree. listen without expectation. Sing. It might take a day. It might take a lifetime. One thing is for sure, when trees sing, they can only be heard by those who are listening.